Oscar Stolper has chaired the Research Group Accounting & Finance since 2014. Prior to joining the University of Marburg as a junior professor, he graduated in International Business Administration at the University of Tuebingen and received his doctorate at the University of Giessen, where he had been working as a research assistant with the Chair of Financial Services (Prof. Andreas Walter) since 2009. His dissertation project was awarded a fellowship of the Stiftung Kapitalmarktforschung für den Finanzstandort Deutschland. Oscar Stolper has a focus on empirical capital market research and behavioral finance. 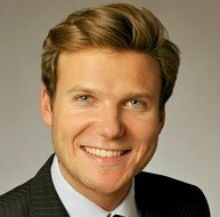 He has specialized in analyzing the decision behavior of private households in their role as financial market participants and has collaborated with researchers from other universities and institutions such as Deutsche Bundesbank, to which he has been affiliated as a visiting researcher since 2010. His work was published in renowned finance journals including the Journal of Banking and Finance und the European Journal of Finance and has frequently been presented at leading conferences in Germany and abroad.